Boom, 2 weeks in a row. I've shifted from the old way I used to do the strip to a certain extent by using colour. The problem is that the Wacom has a pretty ropey display and I find it very hard to get a good colour profile. I know this is a pretty 1st world problem.. boo hoo my spare mac display doesn't have the right gamma, boo hoo... but what I really mean is I'm going to have to spend a bit of effort trying to sort it out. Back to filling out job applications. More next week. A year is a fairly long time to be overrun by Zombies, but that's life. Art wise- things haven't changed much. I've done very little proper work in the past year, though I've done some "Graphic facilitation" found some cracking new pens and paper, and have bought a Cintiq. Worth a quick look at www.strangebiros.co.uk to see the sort of stuff I've been doing. Last weekend was 24HCD, but I was suffering from a weedy cold, so only managed 8 pages. However they were 8 "ok" pages, and it was a good warm up for getting back to Wychwolf... as I sort of had BPRD helping out BrightAngel with an aquatic squid peril. I have four days of work next week, then I'm off til, the New Year. Adam has drafted the outline of the remainder of this part of the wychwolf story, so hopefully we can push through during the holiday and get everything finished an into a buffer. I'm going to need as much slack as I can have come the end of January as I start the Further Object Oriented Programming module of my CS course. When we visited Kingston Lacey a while back we found so many odd things that just had to end up in the wychwolf story. In this case the gardens of Kingston Lacey really do have obelisks and such like scattered around them. 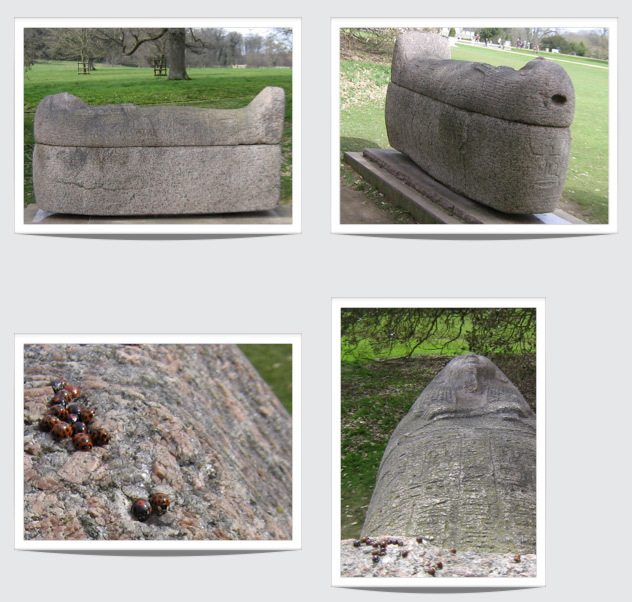 We found a sacrophagus and it was covered in ladybirds. I'll see if I can dig out the photos. I listened to a podcast with John Allison who creates "Bad Machinery" talking to Dan Berry this morning as I walked the dog across the frosty fields. It was strangely depressing for me, as John is very forthright, and honest in criticising the UK Web-comic community, for it's lack of professionalism, and the inability of the artists to sell stuff. Having been on the table next to John at the last UK webcomix thing I understand what he is talking about, and feel I am definitely in the poor performing camp. But what do I do about it? Do I knuckle down and pull out the stops and only produce the very best work I can? Or do I give up? I'm not sure. I've enjoyed learning in public, whilst working on the Wychwolf story, but sometimes it really is a lot of old bother. Second week in a row that I won't be updating. I'm working hard on an online conference. Normal service will be resumed next week. The 24HCD 2012 story I did with Gerald and Brian is now in the iBooks store for free. Having a whole story to test out the new ibooks author tool, and submission process is really useful. I have a Children's story book that I've been working on for ages... and I understand the ibooks process reasonably well now.